This project, run and directed by Haifa University and with the cooperation of the University of Cagliari, Sardinia, is aimed to explore the archaeology and the history of the 'Northern (non-Philistine) Sea Peoples’ - Shardana and Sikulu. These tribes are known for been settled in the northern coast of Canaan in the 12th century BCE, but their settlements were unknown so far, except Tell Dor. In 1992 a new site was discovered, which have changed our view and opened new horizons in the subject (and see below). From summer 2002 and for the four consecutive years we intend to extend the dig into three sites: el-Ahwat, Tel Assawir and Mount Carmel site 146. El-Ahwat is a surprising discovery in the Biblical Archeology of Israel. 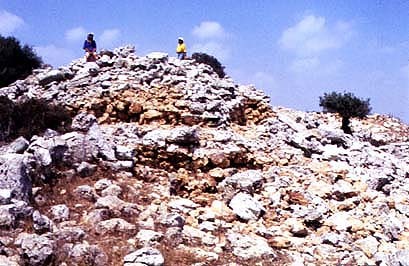 The excavations at the place (el-Ahwat, in Arabic - 'the walls'), a fortified site located in central Israel and dated to the early Iron Age, exposed architecture influenced by the western Mediterranean 'Nuraghic' style. The site was discovered in November 1992, during the survey of the hill country of Manasseh. The large city, hitherto unknown, is located on a high hill overlooking the Samarian mountains, the Carmel range, the Mediterranean coast and the Nahal ‘Iron (Wadi ‘Ara) historical road. Founded in the Iron Age I (end of the 13th century BCE), it lived only about 50 years and then abandoned, never to be settled again. The architecture found presumably connects the site with the buildings of Sardinia in the western Mediterranean. There, corridors and ‘tholoi’ typified the Nuragic culture of Bronze and Iron Ages in the island; and similar constructions were unearthed in our site. Historically, it connected the place with the Shardana, one of the well-known ‘Sea peoples’ tribes. The Shardnan were famous warriors and mercenaries. Originated at Sardinia, they said to be settled in Canaan together with the Philistines by pharaoh Ramesses 3rd following his victory over the ‘Sea-peoples’ (ca. 1180 BCE). Tel Assawir : Being a new excavation (the tell has never been excavated before), Assawir is your opportunity to become involved with a dig at the very beginning. Located 8 miles east of Caesarea, Tel Assawir is situated on the entrance to the important Wadi ‘Ara pass. The tell was suggested by Albright (1923) to be a contact point between the coast controlled by the 'northern Sea-Peoples' and the Israelites wgo settled in the hill country. A preliminary survey recovered figurines, seals, pottery and stone objects. These objects are strong indications of Tel Assawir’s archaeological promise. Our main goals for the first season are to establish the site’s chronology and to find its fortification system. Volunteers are invited to participate, no previous experience is required. Information and Application for the 2002 Season. Age: from 16 up; good health (in certain cases a medical certificate may be demanded); no prior archaeological experience is required. Dates: Sunday, July 7th to Friday, August 2nd (four weeks). Minimum stay: One full week (Sunday-Thursday). It may be possible to extend your stay, depending on available space. Lodging will be at Kibbutz Barkai, about 2 miles from the dig site. Rooms, which are well equipped, will house 3-4 people per room. There is a bathroom and kitchen in each floor. Meals are served in the dining room except for breakfasts that are at the site. It may be possible to stay at the Kibbutz on weekends for an extra 35$ per day. Assistance will be available for those interested in sightseeing in Israel. We will meet all of you every Sunday morning at 10:00 Is at Hadera central bus station. You can get there by Bus no' 540 from Jerusalem/ Ben-Gurion airport; bus no' 921 from Tel Aviv and 921 from Haifa. For those how can't be at Hadera in time, there is a bus to Kibbutz Barkai no' ..., every hour from Hadera central bus station. Mail to and from Israel takes about 3-10 days. Working days are Sunday to Thursday, from 6:00 am to 13:30 PM. On Sundays work is from 12:00 noon to 18:30 PM. On Monday, Wednesday and Thursday will be additional archaeological assignment in the afternoon. Some evenings there will be lectures given. On Tuesdays, there will be a guided bus tour to other archaeology site in the area, such as Caesarea, Megiddo, and Tel Dor. 5:00 -- Wake up and morning coffee. 5:40 -- Bus leaves for site. 8:30 -- Breakfast under the tree at the site. 11:30 -- Watermelon break at the site. 13:30 -- End of working day. 14:00 -- lunch in the dining room. 17:00 -- Coffee/tea; washing and reading pottery. Bed sheets, a pillow and blankets are provided. Work clothes for the field. Long sleeve and pant to protect from the sun are recommended. A hat and high boots are essential! We will provide work gloves. Casual clothing to be wears in after work hours and weekends. Free laundry service will be available once each week. Sweaters are recommended for early mornings and cool nights; sunglasses. Bring sunglasses, sun cream, bathing suit; towels, toiletries, personal medication. Basic fee is $250 per workweek (Sunday - Thursday). Previous dig participants will receive a 5% discount. It is possible to stay at the Kibbutz on weekends for an extra 35$ per day (70$ per full weekend). Prices include full accommodation, Once-a-week laundry; bedding, transportation to and from the site; full participation in all activities of the dig and dig tours. Prices do not include transfer from airport and back, health and other insurance, medical care, clothes, boots etc. Guided tours to different parts of Israel are to be organized in weekends, limited to minimum number of participates. The price for each weekend tour is 25$ (due to changes). Meals and entry fee to sites and museums are not included. The tours will be guided by professional tour guide . All payments, in checks (no travelers checks),should be send in advance for the full stay, made out for "the survey of Manasshe" to: Amit Romano, Department of Archeology, Haifa University Mt. Carmel 3l905 Israel. No refunds will be given for shortening stays. No refunds can be given for cancellation after June 22nd. Prior to this date, full refunds will be given.